Rohan pushed open the door, ran straight towards his bedroom to the cabinet where his things are kept. And in an instant I could feel the aroma of his most favourite perfume fill the ambiance. Yes, we humans are like that. Where ever we go be it office or an important meeting or at a friend’s place or a get-together or to impress someone or even at the gym or any and every place, we like ourselves to smell fresh. 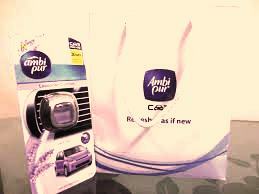 That was it and thanks to Indiblogger I applied for the Lavender Ambi – Pur mini vent clip so that atleast he understands how it feels to have a drive with a soothing fragrance rather than a stale odor. And in few days we received the vent. I must say, I was pleasantly surprised by the way the vent was shipped. The vent comes with a clip to fix it on the AC wings and a nob to turn as per our wish from low to high depending on the amount of fragrance we need. This is an apt way to control the use of the perfume as well as the quantum of fragrance in the car. Once we set the nob to high, with air-conditioner on, the entire car was filled with the aroma of Lavender and it was like Wow! The fragrance is strong yet subtle. We kept the nob on for few minutes and then turned it off just to check whether the fragrance stays and to our surprise it stayed for quite a long time. “This is amazing. I am feeling so fresh without a tinge of stress and all happiness even after driving some 200 odd kilometers! I am totally Ambi-Pureeedddd!!!! Exclaimed Rohan. #FreshNHappy He is totally in awe of the product and so am I and has asked me to buy a new one as soon as the vent is empty. All the weird, rusty odors just seemed to vanish into the thin air and Lavender was what it occupied instead. The soothing, calm and wonderful fragrance is what one needs to have a stress free drive especially in traffic ridden and bumpy roads of Mumbai and Ambi Pur gives it. With a total of five flavours to select from, according to one’s tastes and preferences, Ambi Pur surely knows how to keep a car smelling fresh and happy all day. It is said, “A man has a distinctive personal scent which his wife, his children and his dog can understand.” Similarly a car too must have a distinctive personal scent which his owners can understand and that can only be given by Ambi Pur.” A double thumbs-up for the product! A must have for your car for a superb odor free and a #FreshNHappy, refreshing driving experience. Make this Holi Safe for your little ones with Rangeela!